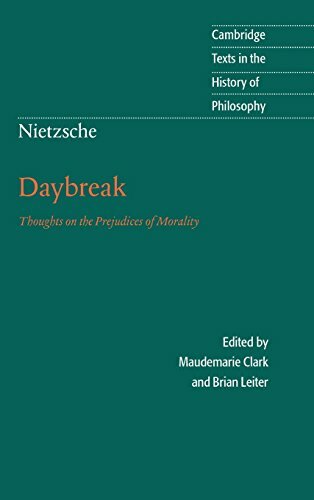 Amazon.com description: Product Description: Daybreak marks the arrival of Nietzsche's "mature" philosophy and is indispensable for an understanding of his critique of morality and "revaluation of all values." This volume presents the distinguished translation by R. J. Hollingdale, with a new introduction that argues for a dramatic change in Nietzsche's views from Human, All too Human to Daybreak, and shows how this change, in turn, presages the main themes of Nietzsche's later and better-known works such as On the Genealogy of Morality. The edition is completed by a chronology, notes and a guide to further reading. About: Daybreak marks the arrival of Nietzsche's "mature" philosophy and is indispensable for an understanding of his critique of morality and "revaluation of all values.